12 tags of 2013 August involved traveling and masked stamping techniques. I made 2 tags, as the first one was again a bit of a miss. 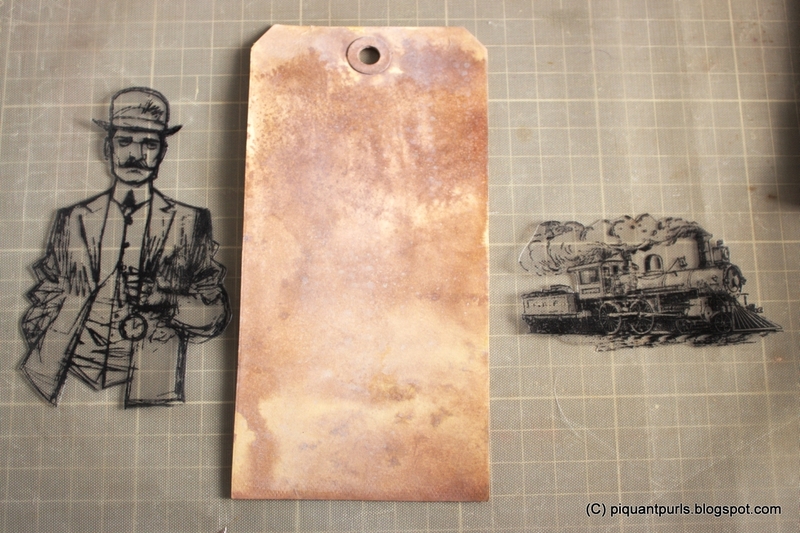 I started off with stamping the masking sheet with one of the gentlemen from the Time Travelers -set and the boat TRAIN (boat? what on earth?! that is a bit embarrassing) from the Travel ways -set. The first background I made was with Vintage Photo and Picket Fence. My second try was with Pumice Stone and Rusty Hinge, and this time everything went much better. 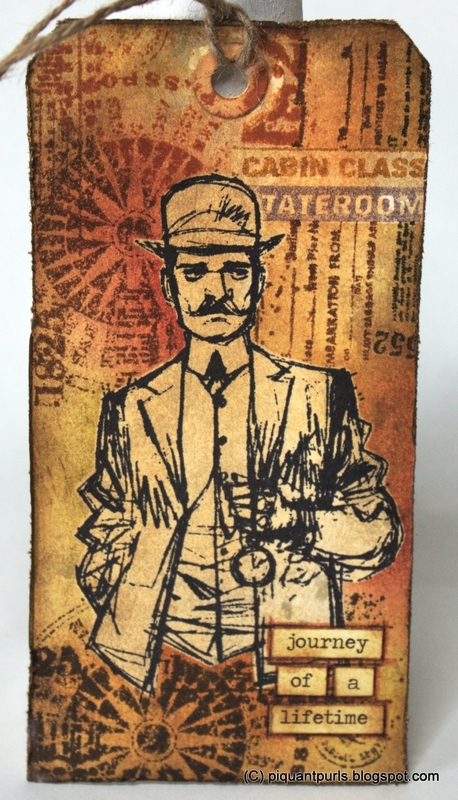 I left out the train and instead masked the "Cabin Class Stateroom"-stamp in addition to the gentleman. I tried to experiment with more colors in the background as well, but it is almost invisible - there's Fired Brick and Peeled Paint as Distress Inks. 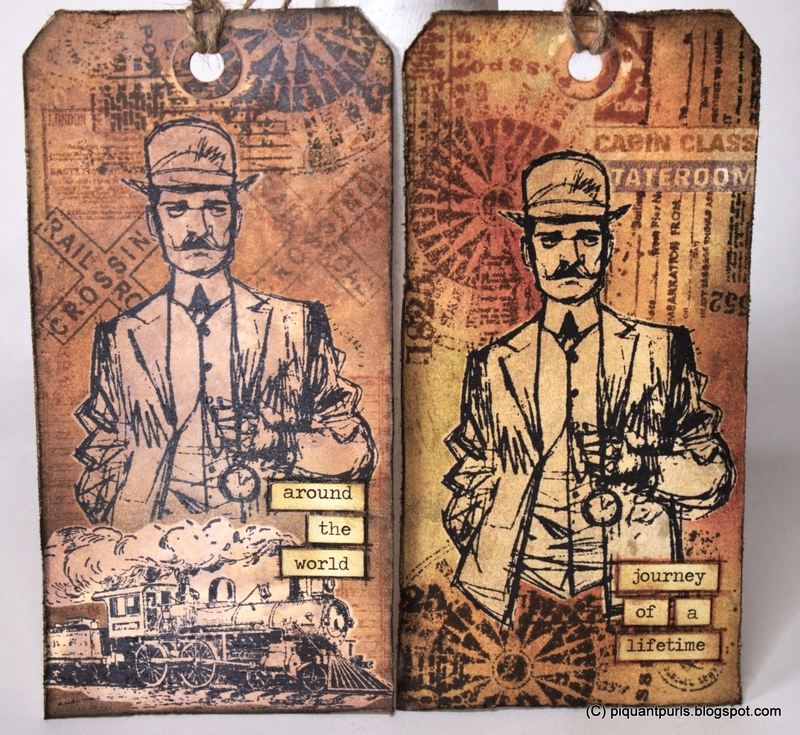 The large compass -collage stamp is from the Layers of Life -kit from Unity Stamps. Here's a comparison between the 2 tags, which shows very well the effect the Picket Fence had on the whole tag. 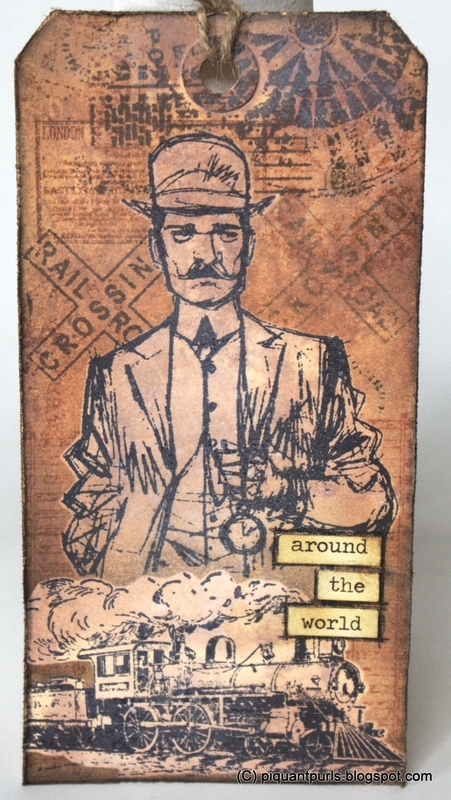 I get a huge Jules Verne-wibe from the toned down tag, hence the "Around the world" text. Both tags are simply stunning! Great take on the challenge! Absolutely love your take of Tim's tag. The man in the tag makes it so much more vintage travels. Super! These are Awesome tags!!! Love your idea for the tags!! Well I am going to go out on a limb here and admit that personally I am partial to the whitewashed picket fence tag - but both tags are amazing. I think the time traveller guy is a perfect as a focal point and you are so awesome at pulling all your colours and stamped images together. I think you are going to be one of this months winners. I really, and I mean really, love how you did the gentleman with the train. That tag is stunning and just perfect.